Thank you for being a digital volunteer! It’s very important that this work is performed in a standardized manner, so please make the effort to read and follow these instructions. Also remember to check the GENERAL INSTRUCTIONS page. 2) Once a volunteer decides they've finished and they're ready for review, a different volunteer (who must have an account on the site) can review the transcription and either send it back for edits, or complete the transcription. The Bureau of Refugees, Freedmen, and Abandoned Lands, often referred to as the Freedmen's Bureau, was established on March 3, 1865. The duties of the Freedmen's Bureau included supervision of all affairs relating to refugees, freedmen, and the custody of abandoned lands and property. Please explore in more detail the Freedmen's Bureau's history and the ways the public is helping historical and genealogical research at this overview from the National Museum of African American History and Culture. The Freedmen’s Bureau collection is available courtesy of the U.S. National Archives and Records Administration, FamilySearch International, and the Smithsonian National Museum of African American History and Culture. These images were provided to the National Museum of African American History and Culture courtesy of the National Archives and Records Administration and FamilySearch International. The original records are located in the Bureau of Refugees, Freedmen, and Abandoned Lands, National Archives Record Group 105. Read on to find instructions, as well as frequently asked questions below. The Freedmen’s Bureau papers are a unique set of materials. The papers include lists, letters, tables, notes, handwritten documents, and typed documents. Each page is different. Please transcribe the words and paragraphs as you see them. The transcription center has a set of basic and advanced guidelines to help you transcribe. Please review the guidelines before you begin. You can also download these Freedmen's Bureau Instructions & Helpful Hints. The instructions will open in a separate tab and you may then download them. Some of the Freedmen’s Bureau papers include tables or columns of information. If the table is not too complicated, please try and transcribe the table using markdown. Markdown allows us to later format the information you type into a table. Some correspondence includes names, events, organizations, or dates in the margins of the letter. 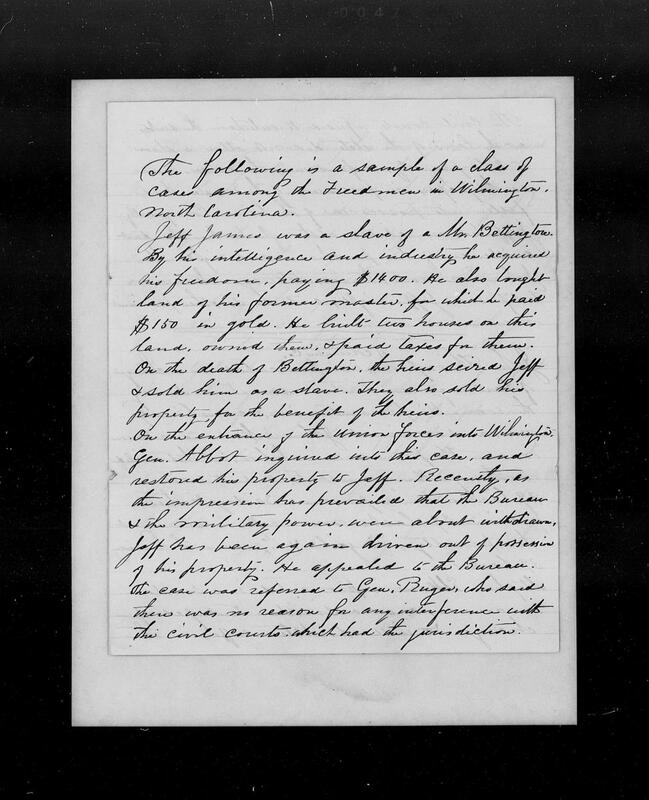 The following are guidelines for transcribing the margin notes, demonstrated in this example correspondence page, which has been formatted by the Freedmen's Bureau Papers team. Next, transcribe the address of the recipient. The last name of the recipient is always in the left margin. Cilley Maj. Clinton A. (or – Maj. Clinton A. Cilley) Asst. Adjt. Genl. Footnotes of comments in the margins using this format [[footnote 1]] text of margin notes. While transcribing and reviewing almanac tables, you may see numbers on their side. Please transcribe these as though they were upright with standard numerals: 1, 2, 3, etc. Many of the letters, reports, and other documents in the Freedmen’s Bureau records had name or subject indexes created to make it easier to find related documents that reference a particular person or subject. These indexes are part of the records being transcribed by the Freedmen’s Bureau Transcription Project. When transcribing a document that is difficult to decipher, it is often useful to use the index (if available) to see if a name or subject is easier to read or understand. Check the finding aid to determine if there is an index available for the set of records that you are working on. Likewise it is often helpful to reference the documents being indexed when transcribing an index. In many cases the description of the indexed subject is in an incomplete sentence and sometimes difficult to understand. One important thing to note is that the short entry for an indexed subject term often leaves the subject term out of the entry. As you transcribe and review, you may find these Abbreviations Lists and Staff Rosters useful. You can may want to download the Freedmen's Bureau Abbreviations List to help your efforts. The Freedmen's Bureau Staff might assist you in identifying signatures, as well. A list of counties in North Carolina which may help in identifying words and spelling. The North Carolina Digital Collections Family Records, from the State Archives of North Carolina and the State Library of North Carolina, provides genealogical and historical information on individuals from North Carolina. This may be helpful in identifying individuals listed in the Freedmen's Bureau Records. You can may want to download these Freedmen's Bureau Frequently Asked Questions. The FAQ will open in a separate tab and you may then download them. As the Civil War drew to a close, President Lincoln and members of Congress debated how to reunite the nation, reconstruct Southern society, and help formerly enslaved individuals make the transition to freedom and citizenship. As one response, in March 1865 Congress created the Bureau of Refugees, Freedmen, and Abandoned Lands, commonly referred to as The Freedmen’s Bureau. 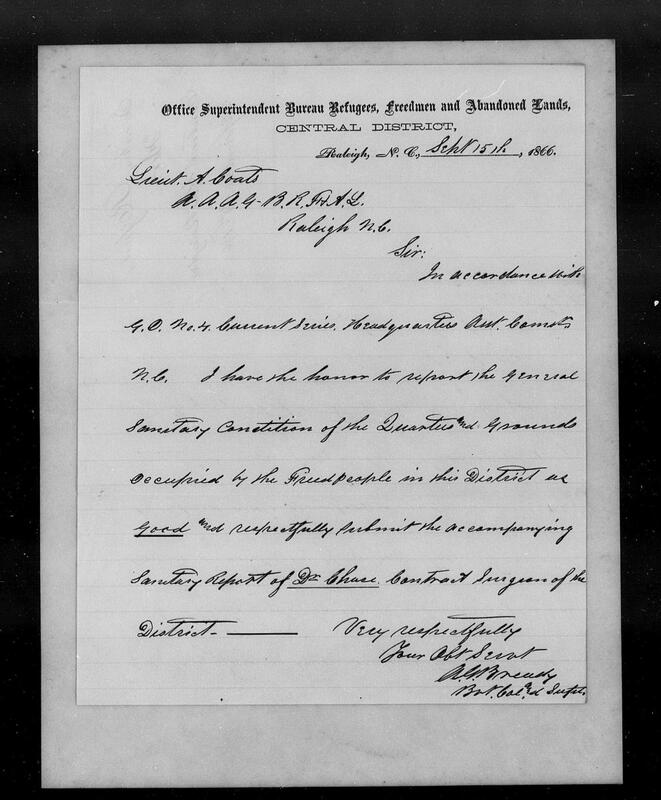 Why is transcribing the Freedmen's Bureau records important? Family historians, genealogists, students and scholars around the world will have easy online access to these records. In addition, these transcribed records will be word searchable, vastly reducing the effort required to find a person or topic. Anyone who has tried to read 19th century handwritten letters knows just how frustrating and time-consuming this can be. Providing typewritten versions of the original documents will make it more likely that more people will use these records. These researchers will vastly increase our understanding of the post-Civil War era and our knowledge of family life, especially African American family life. What's the difference between the FamilySearch genealogical indexing project and the NMAAHC Smithsonian Transcription Center project? The Freedmen’s Bureau Project has created a searchable database of genealogical material drawn from the Freedmen’s Bureau records: primarily, names, places, dates - you can find that at DiscoverFreedmen. This information is particularly useful for African American family historians who cannot rely on their ancestors appearing in the pre-1870 United State census or many other official records. On the other hand, the NMAAHC Smithsonian Transcription Center project will transcript every word of every document in the Freedmen’s Bureau records. Once transcribed, those records will be word searchable. This will allow anyone to search for a name, a place, a topic and to read the full document and connect it to other related documents. Where are the original documents located? What if I want to see the original document? The original Freedmen’s Bureau records are preserved by the National Archives and Record Administration, headquartered in Washington, D. C. The original documents are not accessible to individuals but researchers can view microfilm copies of the records at many of the Federal Record Centers. Where can I go to learn more about the Freedmen’s Bureau? Bentley, George R., A History of the Freedmen’s Bureau. Philadelphia: University of Pennsylvania Press, 1955. Reprint, New York: Octagon Books, 1974. Cimbala, Paul R., Under the Guardianship of the Nation: The Freedmen’s Bureau and the Reconstruction of Georgia, 1865-1870. Athens, GA: University of Georgia Press, 2004. Crouch, Barry A. The Freedmen’s Bureau and Black Texans. Austin: University of Texas Press, 1992. Du Bois, W. E. B. Black Reconstruction in America, 1860-1880. New York: Harcourt, Brace, c. 1935. Reprint, New York: The Free Press, 1998. Foner, Eric. Reconstruction: America’s Unfinished Revolution, 1863-1877. New York: Harper and Row, Publishers, 1988. Thank you for volunteering to transcribe the Freedmen’s Bureau papers! We truly appreciate your time and effort in making these materials available to a broader audience. Have questions? Please contact the Freedmen's Bureau Papers team.